The Kitchen has long been the best place to invest to improve the overall look and value of your Home. The Kitchen has also been one of the most expensive areas of your home to upgrade. Now with new innovation that cost can be lowered significantly. What if you could get Quality Plywood Cabinets starting at $1550 for a 10x10 kitchen. Would you jump for joy? Well, start jumping. Knock Down Cabinets have come a long way since those early assemble yourself Cabinets. These Cabinets have been installed in Million Dollar $ Homes. Home Builders have discovered them and are now using them in new homes. The High Line - Knock Down Cabinets are of the highest quality and have Solid Wood Doors, Dovetail Drawers with Heavy Duty - Soft Close - Full Extension Drawer Slides, and Full Plywood Box all around. No Particle board. Making these Cabinets currently one of the best bargains you can get for improving your home. The Kitchen went from a Great Expense to a Great Return On Investment. At BLUE ROCK - CABINETS most HIGHLINE KITCHENS can be INSTALLED w/ GRANITE for between $5000 -$10,000 ! Knock Down Cabinets are completely finished Kitchen or Bath Cabinets that are “knocked down” to fit into a flat pack box. Giving you many advantages to Pre-Built Custom Cabinets. One major advantage being significantly lower cost due to savings in Shipping and Labor. Knock Down Cabinets are sometimes called rta Cabinets or ready to assemble. 1. Quality - Knock Downs automatically get the "Plywood Upgrade" you have to pay extra for with conventional Cabinets. 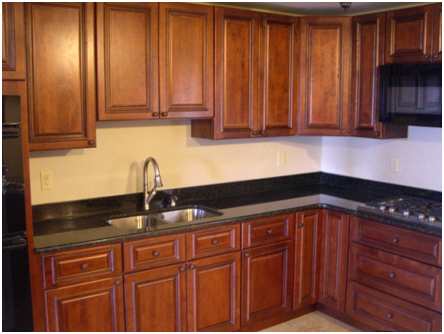 As Conventional built Cabinets use laminated particle board as standard construction. Which absorb water and fall apart. 2. 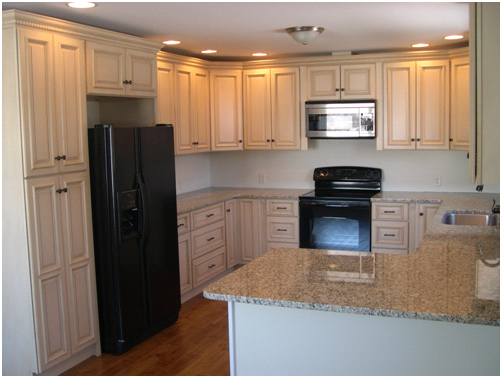 Save Money $$$ - Knock Down Cabinets are significantly less expensive than conventional pre-built Cabinets. 3. Easy to Transport - Knock Down Cabinets are flat pack in a box and usually only one person is needed saving money in labor. How can this guy sell at such a low price ? Business Overhead and Markup are another factor you need to be aware of. Big Box Stores with alot of employees, have to markup their product more than a small shop to cover their Big Overhead. Big space is big expense, who do you think is paying for that ? Knock Down Cabinets aren't for everyone, as some people can only see value thru a Name Brand or Price Tag. For the rest of us, the word is out on knock Down Cabinets, they are Quality Cabinets at a Great Price. Contractors, Builders, Home Owners, House Flippers, Real Estate Investors, will all benefit by using these Cabinets. When you’re ready for a “Beautiful Kitchen at a Great Price” , it’s time to call BLUE ROCK - CABINETS ! 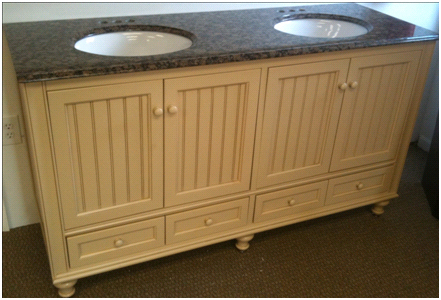 For more information or questions please go to www.bluerock-cabinets.com ,,, 717-368-7111. Located in Lancaster Pa.﻿ We ship to all UPS Freight locations. Copyright 2012 Knockdown Cabinets. All rights reserved.